In the latest mid year numbers for Appraisal Institute membership, 15,000 members have paid their dues as of May 31, 2017. That’s 3,000 less than this year’s projected 18,000 total on their web site. AI National forecasted a 700 member drop in membership for 2017. In all fairness, AI National could see additional sign-ups but this will be tempered by the now spirited debates surrounding their governance proposal. The key issue in front of the organization now is the “taking” policy where they announced their plans to take chapter funds last fall. This was largely done without advanced warning or membership input and their recent governance committee came up with a similar recommendation. I assume the faster decline in membership occurred because of all the unknowns with AI National’s future or actual survival in the short term. In the following chart, I matched up the current ASC registry totals with AI membership through the middle of the year (May for AI National and July for ASC). 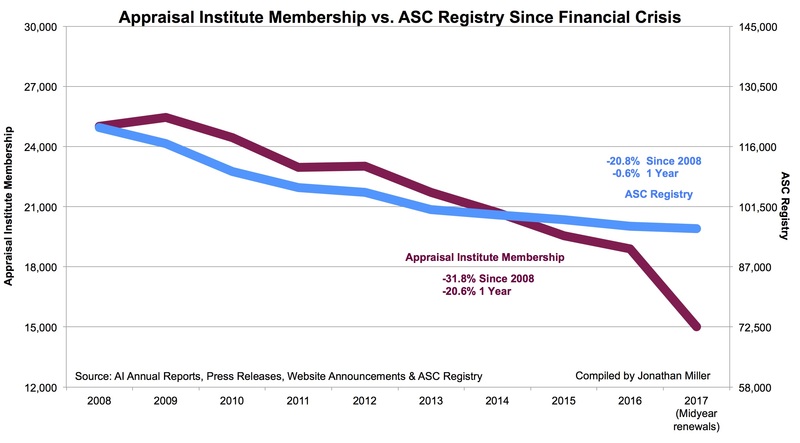 Since the financial crisis, AI membership dropped by one-third while the appraisal industry fell 20.8%. The latter makes sense given the housing bubble peaked a decade ago. In what reality does a trade group’s leadership get a pass when their membership falls faster than the industry they claim to be leading? An URGENT request to my readers: I have only been able to verify AI membership totals back to 2007 and a 25,000 total for 1995. If you have any annual membership totals by year prior to 2007, it would be greatly appreciated. I would keep the source anonymous. I am interested in comparing the AI membership trend since 1992 when the ASC registry data begins. After last week’s post went viral: “Sadly, The Appraisal Institute is now working against its local chapters“, I thought I’d follow up with additional thoughts on AI National’s chapter money debacle. On November 18, 2016 the Appraisal Institute Board of Directors adopted their Chapter Financial Management and Administration Policy. 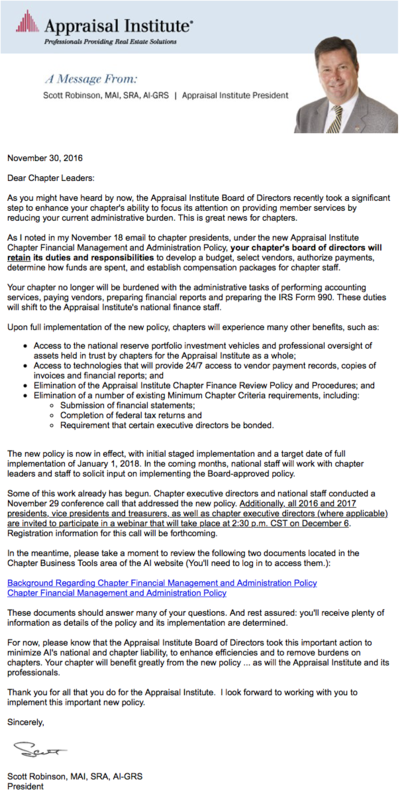 I assume most chapter officers are not aware of the details of this major AI financial chapter restructure plan whose policy is officially in place. Excess cash held by Chapters shall be consolidated with the Appraisal Institute’s Reserve Fund Portfolio (“Portfolio”). In determining the initial deposit into the Reserve Fund Portfolio, cash and investment balances greater than three months of the average monthly Chapter operating expenses will be considered excess cash. The average monthly operating expense will be based on the last three fully closed years. Deposits from Chapters to the Reserve Fund shall be comingled with Portfolio assets, however will be accounted for and tracked separately. Lets say a chapter has $200,000 in the bank. This money was collected from chapter members with their hard earned appraisal fees. The money enables a local chapter to function, bring in guest speakers, cover operating deficits, pay for an executive secretary and other operational items. I already know there are chapters with as much as $100,000 to more than $300,000 in their chapter bank accounts. Lets say the three year average of my example chapter’s monthly expenses is $5,000. By the AI policy formula, all cash in the chapter’s account above $15,000 (3 x monthly average) will be sent to National. AI has said they will keep records of where the money came from. So in my example, $185,000 ($200,000 less the $15,000 calculated amount) immediately goes to National where it is commingled with other chapter’s funds. There is a complex (to me) protocol for getting the money back to use at the chapter level. It makes me wonder what happens when a chapter needs money to keep the doors open but doesn’t have it or has a short term financial emergency. For most chapter members who already have full time jobs or a part time executive secretary, the process of getting access to cash at last minute to solve an unforeseen problem seems like an unfair burden. Contrary to the sales pitch given by the president in the previous post, I believe this policy will create additional clerical burdens and reduce the flexibility of the chapters. As time passes, combined with National’s inability to keep chapters and membership informed in recent years, the details of this “taking” will get hazy as time passes. Over the long term it is unclear what will happen with each chapter’s money. This and other AI policies are being written in such an open ended way, clearly banking that membership or the chapters won’t read it and won’t have a way to stop it once they do. Once National takes most of the money from the chapter bank accounts, the chapters are forever at their mercy. Do chapters really want to be placed in this position? I recently spoke to an AI member, with a reputation among local peers for cheerleading AI mandates for his own political gain. This person told me that the so-called chapter money was really “National’s money.” I can only believe that such an orientation came from National. I immediately corrected the member, saying that “no, it was the chapter/members’ money.” This position spoke volumes about how National sees the chapters as working for National rather than as National working for the members. Chapters are literally paying National to manage the chapter fees National has decided to take from the chapters without advanced warning. Incremental costs (“Incremental Costs”) incurred by the Appraisal Institute Finance Department to execute the responsibilities delineated to it within the Policy shall be funded by a fee payable by Chapters. Incremental Costs represent expenses incurred that otherwise would not have been payable by Appraisal Institute without this Policy and may include, but are not limited to, personnel, technology, banking, audit and tax services. The amount payable shall be calculated for each Chapter as a Base Fee plus a Variable Fee Percent of such Chapter’s average annual expenses. 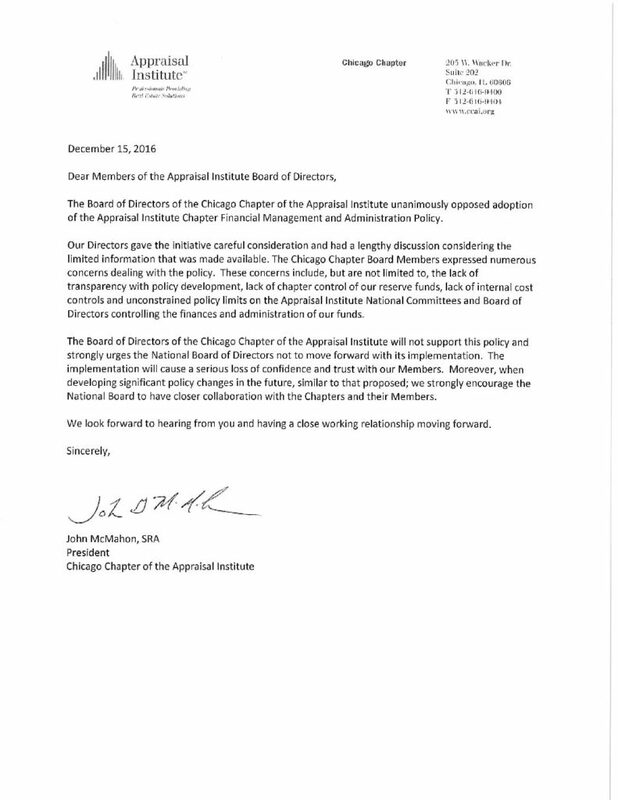 The Base Fee and Variable Fee Percent shall be established by the national Finance Committee, subject to the national Board of Director’s approval, so that total amounts paid by Chapters under this section of the Policy shall reimburse the necessary Incremental Costs incurred by Appraisal Institute to execute its obligations under the Policy. The combined Base and Variable Fee shall be paid in four equal installments on a quarterly basis. Please get familiar with this policy document and remember that the AI board has already adopted it without vetting it with the chapters. I repeat: this is now an active policy of the AI. After National takes the “excess” chapter funds (my example of $185,000), it charges the chapter to manage it including costs for additional staff. And even more of a concern, the amount of the fixed plus variable cost structure the chapter will pay has not been determined yet. All AI chapters are effectively losing control of their “excess funds” but don’t know how much National will charge them to manage those funds. Based on the fixed plus variable format, a large chapter will probably pay more than a small chapter for National to manage the chapter’s money. I would argue that the larger chapters are being financially punished by National for being larger. The irony here is that larger chapters reflect a certain level of success by attracting and keeping more members or being able to generate funds for a rainy day. Plus the AI money management process is the same for a chapter with $10,000 in excess funds and one with $200,000 in excess funds. Since the chapter funds are tracked on a spreadsheet or accounting software, the number $10,000 is not easier to enter into a spreadsheet cell than the number $200,000 so the size of the chapter is immaterial. If National maintains that chapter size is material, then the unannounced variable plus fixed management fee should be much larger than if size didn’t matter. I would argue that smaller chapters will require more management than larger chapters, no? I find the commingling of funds unnerving since membership generally does not trust National leadership and this massive shift in policy was done without communication to the chapters, let alone the membership. The scope of this change is not a simple matter. It should have been vetted on a chapter level if National truly respected their chapters. I’d like to naively suggest that the National board adopt a chapter level opt in policy so chapters can decide individually whether to allow AI to run their chapter finances. I can see how a few very small chapters that don’t have executive secretaries could be inclined to ask National to manage their funds. However all chapters will be making quarterly management fee payments to National and be subjected to a myriad of rules in this controversial policy. The very idea of an outside party managing chapter funds seems to add more operating burden to understaffed chapters and their executives who already have full time jobs (usually). The “taking” of chapter funds should be cost neutral. The proposal by National should not cost the chapters a penny. If chapters save operating costs that equals the management fee, then perhaps this can be explored. Otherwise our industry has endured a long term period of fee compression, and this policy simply becomes a money grab by National. At this point, it looks like the majority of the membership and the chapters are against the AI Board decision to take most of each chapter’s cash. If chapters resist giving their “excess cash” to National, would it not be too far to suggest that National will nullify the designations of chapter members in a rebellious chapter? Otherwise, what other action could National take to enforce this “taking”? This recent policy and the unrest it stirred has already tarnished the AI brand and will likely accelerate the exodus of existing members. When leadership of an organization is unable to deliver value to their members, the next step seems to be to take something of value from their members. In this case…cash. The president and board members of the Appraisal Institute demonstrated how little they understand and respect their membership. I believe this is why they enacted a policy to take each chapter’s cash without telling them in advance. As I said in my prior post, AI National is officially obsolete. Every so often, a Matrix reader submits something they feel very strongly about it and bravely enter the Vortex where I post it. Cecil has been a New York general state certified appraiser since 1992. He takes a look at the intersection of professional education and licensing. He’s weighed in here before. Like me, Cecil was an appraiser before the licensing law in 1989 and in fact wrote Congress about this matter as early as 1986. 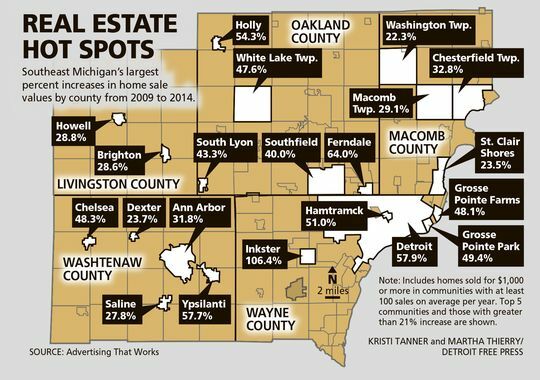 Admittedly this is super appraiser wonkiness, but it’s worth the read. Did we get there? the promise of Licensing Appraisers. How technically prepared are Certified General Appraisers? A recent editorial by Henry H. Harrison in his Real Estate Valuation Magazine, suggested the answer is not very well. In fact, Mr. Harrison even challenged readers to provide evidence that Certified General Appraisers did not make at least 80% of their living writing residential work. I believe he is correct on the preparation issue, and incorrect on what Certified General Appraisers do in the industry. Most Certified General Appraisers have now become the workhorses for fee shops run by designated appraisers, working as independent contractors at low rates and without benefits. This was by design, and the education and experience requirements set by the Appraisal Qualifications Board in the early 1990s, later amended in 2008, bears me out. It is now generally accepted that the requirements for General Certification set in 1991 were deplorable, although Harrison and other in his group did not think so when I first wrote to him in 1993. The 2008 fix with the addition of a course in Highest and Best Use and Market Analysis, and one in Report Writing was a plus, but the remaining content was just a split of two former lower level courses into some 120-140 hours. The final product was three hundred classroom hours, more than were required for the MAI in 1990, yet these were junior courses. FIRREA had a specific mandate. That mandate required that the education and experience required for General Certification be such, that a person with those qualifications would be able to appraise any property without regard to value in a Federal related transaction. That is a high standard, which was well known to the Chairman and members of the Board from 1991 to 2004, yet they did otherwise. The reasons often given in support of the lower standards were the use of the term minimal education required, that States could add to the basic core, and that Certification requirements were intended as a beginning. But the mandate certainly does not imply that. Basic appraisal education requires only six courses, seven if you add the new Quantitative Analysis course, which is a plus. The seven courses are Appraisal Principles and Procedures, Highest and Best Use and Market Analysis, Land Valuation and the Cost Approach, Direct Sales Comparison Approach, Income Approach, Quantitative Analysis, and Case Study and Report Writing. These names can be applied to Residential and General [Vortex] Did we get there? the promise of Licensing Appraisers. Certification courses with different content, and all that is currently listed by the Appraisal Institute as Level 1 and 2 and required for their MAI designation can be covered in those seven courses. Hours can be assigned based on the content to be covered. The seven basic courses plus four years of experience, and the State Exam, is more than adequate to lay the groundwork for Certification as well as any designation. It should be noted that the six courses used prior to 1990 for the MAI, and the four used for the SREA (101, 102, 201, 202), were all taught in less than three hundred hours. These courses produced some of the best educators and practitioners currently working in the industry, including Mr. Harrison. Even Universities that grant Undergraduate and Graduate Degrees in Real Estate offer only one or two courses in Valuation. I took the trouble to review the education requirements for all of the original members of the Foundation that deal specifically with Real Property interest. The Appraisal Institute of Canada arguably has the best program, and the Appraisal Institute is the only one with Advanced Courses. Some startling facts also come to mind. The education requirements for the MAI designation have increased from 267 hours in 1990 to 482 in 2008, an increase of 215 hours, all without any change in the theory and methodology of valuing real property. The only industry change during that period was the use of software that makes database searches and data analysis easier. 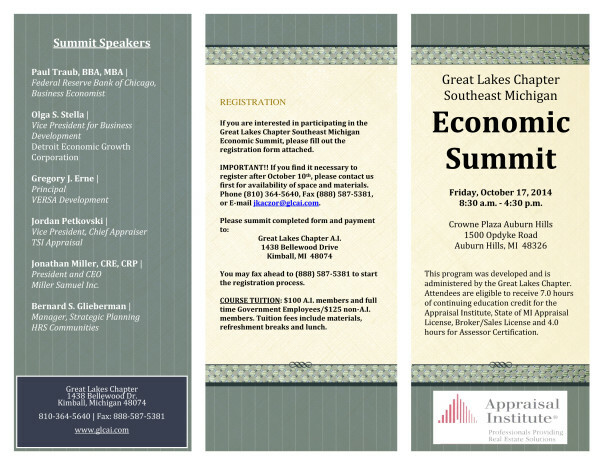 In fact, one group, The American Society of Appraisers could not even remember when they last hosted a basic course. 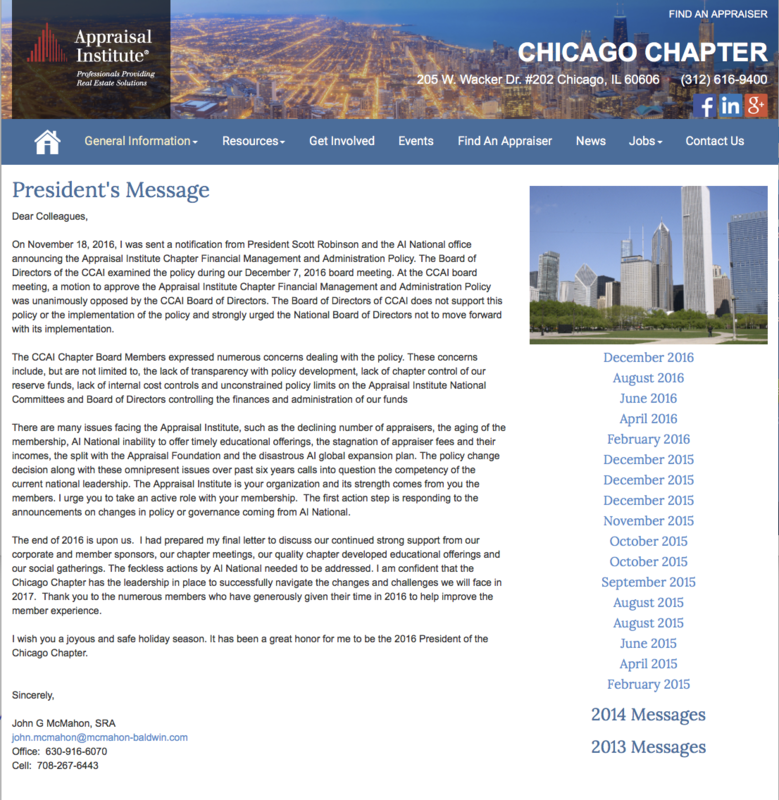 I believe that The Appraisal Institute is the best professional association representing appraisers and the leader in the industry, but its continued creation of advanced courses in order to create the illusion that its members and candidates are better prepared than Certified Appraisers is a farce. The same seven courses could easily serve as the core education requirements for candidates as well as General Certification. Additional requirements for designations can be added. The MAI designation is a highly recognized brand, and could be granted based on work experience and peer review. Downgrading the education requirements for Certification is a dumb idea, and it is clear that The Appraisal Subcommittee fell down on its mandate to monitor and review the practices and activities of the Foundation. There are a few good textbooks out there on Appraising Real Property, and I place The Appraisal of Real Estate, published by the Appraisal Institute at the top of that heap. Now I would hope that any State that puts its imprimatur on the qualifications of any individual to call that person a Certified General Appraiser, expects that they have covered the content of that text from cover to cover. That was the intent of FIRREA. But it appears that by separating the content into General and Advanced sections, both the Appraisal Institute and the Appraisal Qualifications Board that it has controlled since 1989 seems not to think so. This difference in education is the centerpiece of Harrison’s thesis. 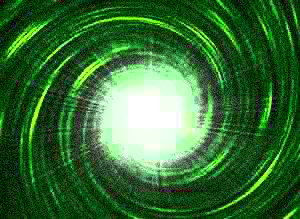 The Qualifications Board should simply set the education requirement as successful completion of a course in the seven areas and forget hours, and if a rigorous State exam is made part of the process, then The Appraisal Institute will be sure to include much of what it now calls advanced content in those seven courses. On the issue of college education, professional associations may find this a plus, and hopefully the appraiser has written enough college papers to be able to write properly, but degrees in most disciplines will not make you a better market analyst. The answer to my original question is yes and no. 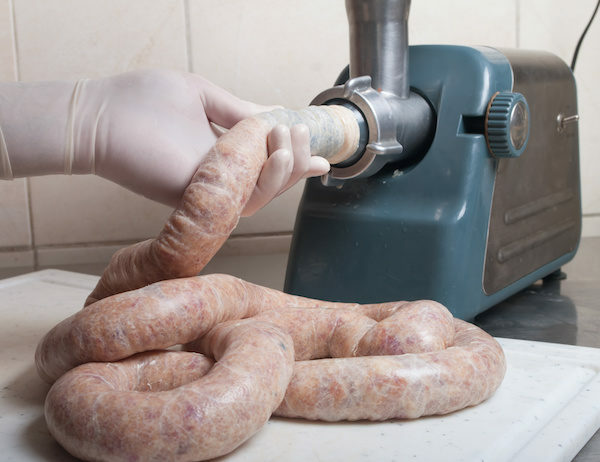 We now have a mechanism to punish bad apples, although better enforcement is needed, but the standards for education, experience and testing did not.